Celeriac exports are off to a good start. "These exports go far and wide. In fact, all countries are on the market. 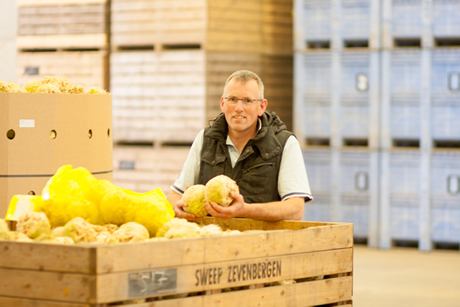 We have noticed that overseas buyers sell imported products alongside their local products", says Pierre Sweep, of Dutch wholesaler, A&P Sweep. "They do not want to be left without product. They ensure a smooth transition to imports. We are moving high volumes even if prices are at a high level." Due to the dry, hot weather, growers' yields are, on average, lower than expected. Pierre says, "We knew it would be worse. On average, the yields are estimated to be at about 75%. Storage qualities are good. This is for both mechanically cooled are well as air-conditioned products." Sizes are also meeting the market demand. "We thought there would be a lot of small celeriac. This is not the case. There are, however, large regional differences. This has all got to do with whether or not irrigation was used last summer. In general, tubers from North Holland and Brabant are good. Those from Zeeland, less so, when it comes to yields", he explains. According to Pierre, the demand for sizes differs depending on the destination. Germany wants medium to large celeriac. Countries in Eastern Europe want smaller ones. "The smaller sizes are left over after sorting. There is a market for these too." "We have, however, seen that the price for these small sizes is under pressure. Fortunately, there is still enough of all the sizes. Therefore, exports continue. Here, however, it is also about selling all the cultivated volumes at a decent price." Prices are high at the moment. So much so, that it is attractive for organic farmers to offer their celeriac destined for the industry to the regular fresh market. Not all organically-grown celeriac can go to the fresh market. The market is too small for that. "So, more tubers are coming from all sides. Volumes are also staying on course", concludes Pierre. Whether the price will keep rising depends on the start of the new season.